214 pages | 9 B/W Illus. 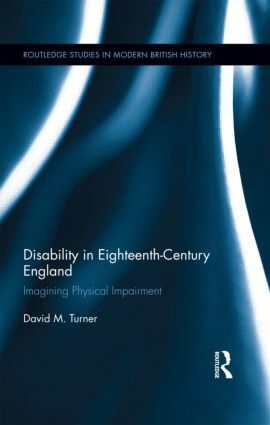 This is the first book-length study of physical disability in eighteenth-century England. It assesses the ways in which meanings of physical difference were formed within different cultural contexts, and examines how disabled men and women used, appropriated, or rejected these representations in making sense of their own experiences. In the process, it asks a series of related questions: what constituted ‘disability’ in eighteenth-century culture and society? How was impairment perceived? How did people with disabilities see themselves and relate to others? What do their stories tell us about the social and cultural contexts of disability, and in what ways were these narratives and experiences shaped by class and gender? In order to answer these questions, the book explores the languages of disability, the relationship between religious and medical discourses of disability, and analyzes depictions of people with disabilities in popular culture, art, and the media. It also uncovers the ‘hidden histories’ of disabled men and women themselves drawing on elite letters and autobiographies, Poor Law documents and criminal court records. The book won the Disability History Association Outstanding Publication Prize in 2012 for the best book published worldwide in disability history and also inspired parts of the Radio 4 series, ‘Disability: A New History’, on which the author was historical adviser. The series gained 2.6 million listeners when it first aired in 2013. David M. Turner is Senior Lecturer in History at Swansea University.